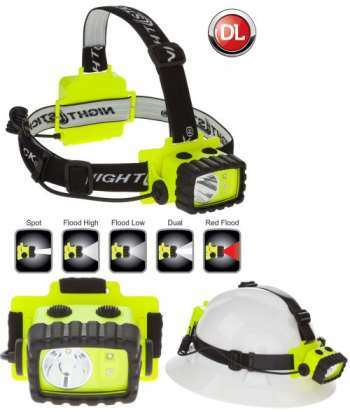 Nightstick Intrinsically Safe Multi-Function Headlamp - LED - 3AACASE OF 4 This non-rechargeable multi-function headlamp is cETLus, ATEX, IECEx and MSHA listed Intrinsically Safe Permissible for use in both above and below ground hazardous locations where explosive gases and dusts may be present. The headlamp features a multi-position tilt head design, a rear-mounted battery compartment and includes both an elastic head strap with a non-slip lining and a heavy-duty rubber strap for use with hard hats. The top mounted dual switches provide spotlight, full-power white floodlight, half-power white floodlight and green floodlight operation. Power comes from 3 AA premium batteries (included).